Those manufacturers plan to introduce several mass market electric vehicles in the coming years and if LG wants to keep its lead, it will need to significantly increase its battery production output. And the Korea-based electronic giant is counting on its Michigan battery plant to keep up with the auto market. Earlier this year, LG announced that it planned to accelerate battery production at the Holland plant in Michigan. Today, Auto News confirmed that production is now in full swing with two of the three assembly lines operating 24 hours a day and a fourth line is on the way. The plant is now at an annual production of 650 MWh according to Navigant, but it could rise to 3 GWh within a couple of years. Assuming that we are calling a ‘Gigafactory’ any li-ion battery factory with a total output of 1 or more GWh, it will be a close race between LG and Tesla for the first Gigafactory in the US. Tesla already started production at its factory in Nevada, but only for stationary storage battery packs. Battery cell production is only set to begin in late 2016. It’s not clear what will be the production output when cell manufacturing will begin, but Tesla plans to ramp up to 35 GWh by 2020. Presumably, Tesla could reach 1 GWh fairly quickly after beginning production. 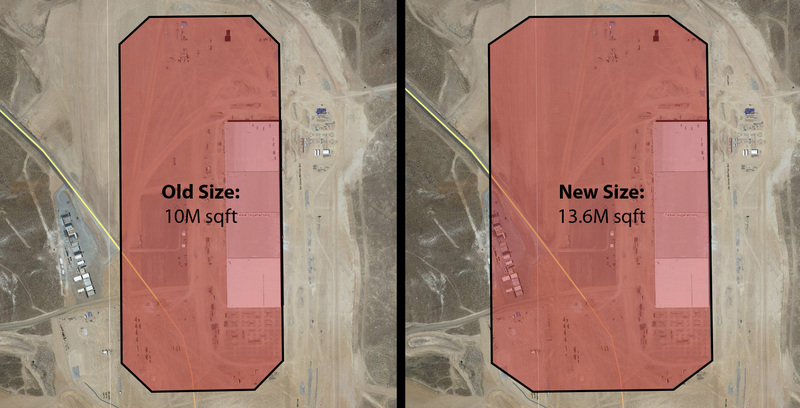 We recently learned that Tesla’s Gigafactory will be nearly 40% larger than expected, but the company has yet to update the production output since the unveiling of the project. Considering Tesla both increased the planned floor space and said that the project is more “space efficient” than initially expected, it is fair to assume that the planned production output is now more than the initial 35 GWh of battery cells and 50 GWh of battery packs. Even though we are calling it a “race”, it is likely a friendly one. Tesla’s mission is to accelerate the transition to sustainable transport and they are well aware that they can’t do it alone. A lot of batteries are needed and hopefully, both the Holland plant’s 3 GWh and the Tesla Gigfactory’s 35 GWh (or more) will eventually only be a drop in the bucket. If you have any doubt about LG and Tesla’s relationship, they recently confirmed working together for the battery upgrade of the Roadster 3.0.